Due to predictions of bad weather, the birthday party Mr. T. was supposed to go to on Friday was bumped up to Wednesday...yes, that is tomorrow. Luckily, I went present shopping yesterday at noon...the card, though, is a total last minute card. Quick and easy! I used my stamp-a-ma-jig (perhaps that was too many hyphens???) 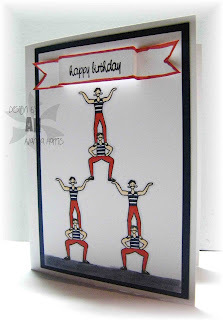 to position the gymnasts in a pyramid, then added the happy birthday banner to the top gymnast. Coloured with copics (no shading on this one!) and it was done like dinner!